Because Ella's 14 months old, it's not often we get the chance to go to the movie theater anymore. And I've slowed down in book consumption as well - well, not counting There's a Wocket in my Pocket or Where's Arthur's Gerbil? I will try, however, to pass on reviews of movies I do manage to see, or books I think might be generally interesting. Where's Arthur's Gerbil was worth the read, for instance. (And it turns out, the gerbil was in Arthur's lunchbox - hope that wasn't too much of a spoiler). 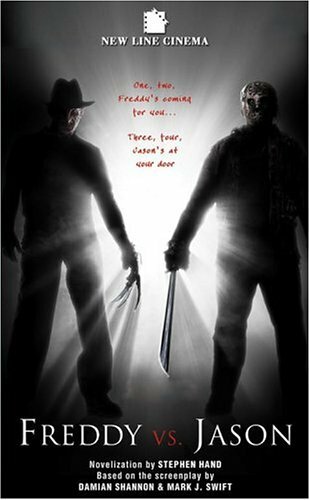 I managed to sneak away yesterday to watch Freddy vs. Jason. Don't roll your eyes - this was the horror movie I never knew I always wanted to see. Come on - what a premise! And the director/writer managed to keep it from being totally campy, and yet fun to watch. This is like those classic questions of our childhood - who would win, Superman or Spiderman? (Superman) Batman or the Flash? (Batman) Aquaman or Wonder Woman? (Who cares? Linda Carter was just too hot for words.) Freddy Kreuger or Jason? (I'm not going to tell you who won... see it for youself) And true to the movie genre, there was plenty of blood, drunken obnoxious kids looking for the fuse box in a power outage, and the only one left standing was the cute virgin girl. This was the first movie I've seen in quite a while that I could go back to the theater to watch again. It was pure entertainment. Bookwise, I urge everyone to go run right out and purchase What Einstein Told His Cook - Kitchen Science Explained. It's a quick read, but explains the science behind why you shouldn't put tomatoes in the fridge, why the best frying pan would be made of silver, and what make kosher salt kosher (no pigs). He injects enough humor to make it fun to read, and has a smattering of recipes throughout the book, including a killer margarita recipe that I'm going to try this weekend. If I drink enough, I'll escape the Freddy nightmares. He's just plain creepy. My work is da Bomb!